Zeus = Father and ruler of the gods….. When you meet him you’ll see why! Zeus is a soft tail with a 35 degree rake. He has a 200 rear tire, strutless rear fender, low rise z-bars, Indian Larry gas tank, colored spoke wheels, 110” RevTech engine, 3” BDL belt drive, a 6 speed transmission, a nice wide spring solo seat, digital gauges, and much more. Some of the variations for Zeus are the forward controls, hand grips, mirrors, belt or chain drive, engine color of black and chrome or natural, exhaust color of chrome or black, wheel color, and of course any paint scheme that you can imagine. Painted by world famous Nub Grafix. 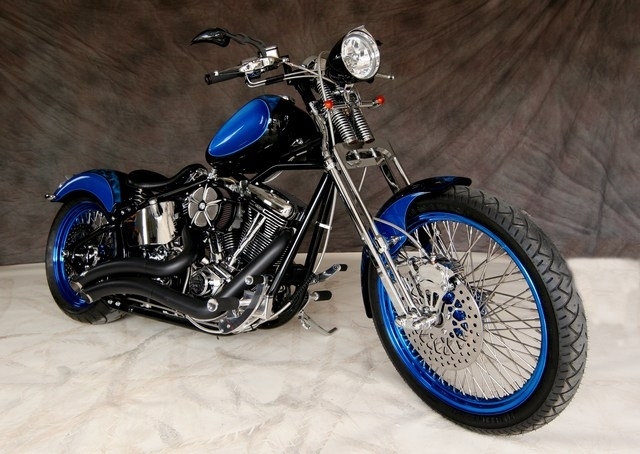 We can also powder coat any part of the bike that you wish or keep it chrome. The choice is yours…. We sell Zeus at a set price, unlike many bike builders who offer a low base price for a very simple motorcycle, and then charge for every little item. We believe in offering the best right up front and in giving you some say in the building of your own bike at no extra cost! Price: $30,000.